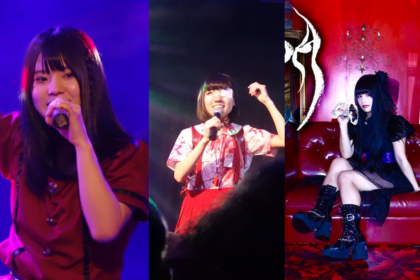 Inspired by the UK rock music scene, LONDON BLUE are a 5-piece outfit consisting of Kana, Kayano, Rina, Kyoka and Rinka. 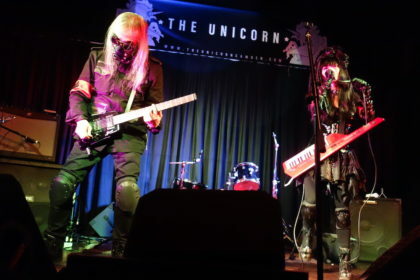 Their eponymous 2016 debut album introduced audiences to the idol outfit’s combination of bubblegum pop and rock. Songs such as ‘『MIDNIGHT LOVER』’ present melodic tunes that also weaves in some guitar work, lending their material a more raw approach to traditional idol pop. Hyper Japan (see the J-Pop Go review) saw LONDON BLUE making their UK debut (sadly, Rina couldn’t join them for their English adventure this time around). The occasion also marks the idol outfit’s 5th anniversary. 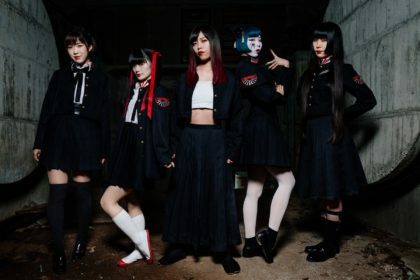 J-Pop Go caught up with them for a brief chat to talk about their excitement about visiting the UK for the first time. When quizzed on the topic of who is the funniest member of LONDON BLUE, the members all seem to zero in on Kyoka-san (“‘Ichiban Baka!’ She’s the idiot of the group! Stupid but energetic!”). But despite their easy-going demeanour, it’s clear that they all take performances very seriously and adopt often quite tricky choreography on stage. 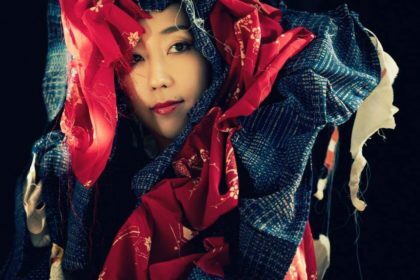 Kyoka: The fact that everything is wrapped up in ‘kawai-ness’ from the style of dress to the people themselves and the dances and the songs – everything has an underlying theme of kawaii. How hectic is life in LONDON BLUE, particularly with learning all the songs and performing at many events? Is it easy learning so many dance moves as well? Rinka: The dances are choreographed so that they can be easily participated in for the audience, but I found that there are some parts that are quite technical and quite hard to remember – so that was a challenge. Kana-san, you’re responsible for the choreography, how difficult is that for you to design the dance moves? Kana: Not easy! Difficult! It’s not hard but it’s not easy! On stage, the dance moves look quite complicated. Kana: It really depends on the song. Sometimes we want a cool mood and sometimes a different mood depending on the song. So it really depends on which song it is if it’s hard or if it’s easy. LONDON BLUE are influenced by UK rock – which is an unusual influence for an idol outfit – do some of you have favourite UK rock bands? What are you most looking forward to on this visit the UK? 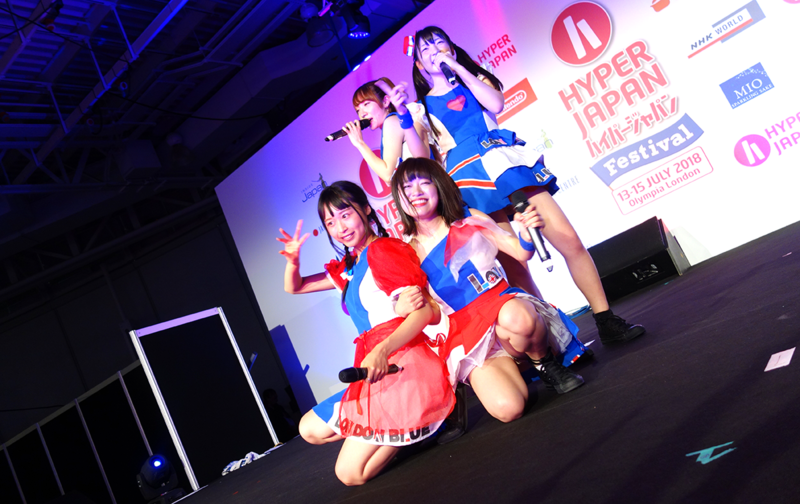 Kana: This live at Hyper Japan! And apart from performing at Hyper Japan? Kyoka: I want to go to Big Ben. Did you walk across the crossing? I believe you also have a new single coming out later this year? Kana: Yes, 5th September in Japan. Ah, same as The Clash? Kana: Yes, we took it from there. With that, the four very tired members of LONDON BLUE took their leave and were whisked off to the airport. 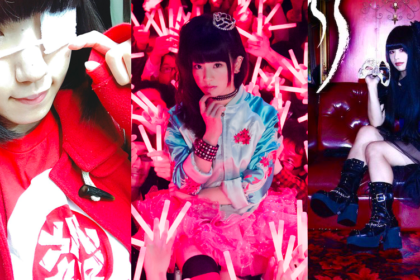 This year’s Hyper Japan seemed to have a idol theme of sorts, but the rock-inspired act certainly managed to win over a lot of new fans for their UK visit. Let’s hope they return for future events. ‘London Calling’ is out 5th September. 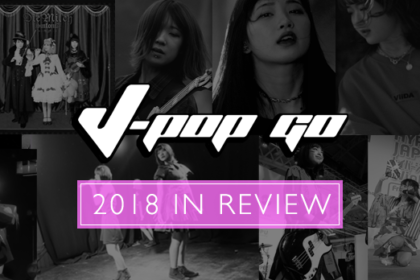 J-Pop Go extends its thanks to LONDON BLUE and the Hyper Japan press team.